Do you want to offer travel or tourist-related services in Florida? 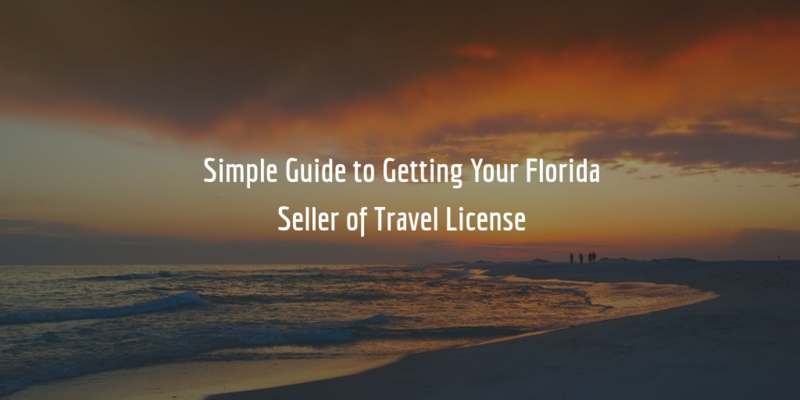 You will need to obtain a Florida seller of travel license from Florida Department of Agriculture and Consumer Services (FDACS) before you can legally operate as a seller of travel in the state. The licensing process for this type of business is fairly simple and involves only a few steps such as to submit your license application or to submit a seller of travel bond in the right amount. Read on below for a comprehensive breakdown of the licensing process. According to Part XI of Chapter 559 of the Florida Statutes, sellers of travel in Florida are defined as those persons or businesses that offer “directly or indirectly, prearranged travel or tourist-related services for individuals or groups, including, but not limited to, vacation packages, or vacation certificates in exchange for a fee, commission, or other valuable consideration.” The term further includes those who offer vacation certificates to third-party merchants for a fee or to consumers, as well as those who offer membership in travel clubs or travel services for a fee. All of the above are required to register annually with the FDACS as sellers of travel. This process involves a number of simple steps which are as follows. According to the Florida Administrative Code and Register Chapter 5J-9 applicants for this type of license must initially post a $25,000 bond. Under certain conditions, outlined in the Chapter, these applicants are offered the possibility to reduce their bond amount to $10,000 by submitting a Security Reduction Application. The Department can take up to 30 days in reviewing an application and is required to notify applicants of any deficiencies in their applications within this period of time. If there are no deficiencies to your application, you can expect to be notified of having been registered as a Florida seller of travel. Licenses are valid for one year from the date of issuance and must be renewed prior to expiring. Apply for your seller of travel bond today! Why us? To applicants that are new to this, the surety bond requirement may require further clarification. See below for more information about why you require a bond and how much it might cost. Businesses are required to post surety bonds in order to provide security to the public and the state that they will comply with state regulations in their operations. Sellers of travel in Florida must post a surety bond to guarantee their compliance with Chapter 559 of the Florida Statutes. If the bonded seller violates the Chapter and through their actions causes injury to a consumer or the state, a claim can be filed against the bond. Among others, such actions include fraud, misrepresentation or breaching the conditions of a contract they have with a consumer. When a claim is filed against a bond, the surety that backs the bond must extend compensation to claimants as a remedy for any injuries they have suffered. The amount of such compensation can be as high as the full amount of the bond but not higher. When compensation is extended, the bonded seller of travel must repay the surety in full, as part of the bond agreement made between them. So what’s the difference between the bond amount and the cost of getting bonded? To get bonded you need to pay a premium on your bond which is only a fraction of its full amount. The exact rate of your premium is determined by the surety when you apply and is primarily determined by your personal credit score. Applicants who have a high credit score are typically bonded at lower rates, whereas those with lower scores must pay more slightly more to get bonded. Applicants with a credit score as high as 700 FICO may be able to get bonded at a rate between 0.75% and 2.5% of the full bond amount. So, if you have to get a $25,000 bond, and are offered a 1% rate on your bond, you will need to pay $250 to get bonded for a year. Bond rates are determined on an individual basis. If you want to know how much exactly your bond will cost, complete our bond application form and we will provide you with a free quote on your bond!